Rep. Bobby Scott (D-VA) stands with Democratic leadership at a 2016 news conference on a higher minimum wage. Scott says legislation to raise the federal minimum wage will be one of the top priorities in early 2019 for the House Committee on Education and Labor. Legislation raising the federal minimum wage to $15 an hour will be reintroduced by Democrats this week, officials told Bloomberg Law. Lawmakers in the Senate and House Jan. 16 will re-introduce the Raise the Wage Act, a congressional aide told Bloomberg Law on the condition of anonymity. Not all details of the expected measure were immediately available, but the legislation would gradually raise the minimum wage to $15 by 2024. The bill also seeks to increase the current $2.13 hourly minimum wage requirements for tipped workers, the official added. This reintroduced legislation would offer the first federal minimum wage increase since the current $7.25 hourly rate was set a decade ago. Congressional Democrats have been trying to increase the hourly wage floor for several years but were rebuffed by Republicans who said wages should be set by markets or state and local governments. Democrats like House Committee on Education and Labor Chairman Bobby Scott (D-Va.) believe $15 wage legislation could engender bipartisanship. The end result could be a compromise of sorts in order to pass the GOP-controlled Senate. Democrats see recent ballot initiatives to raise the pay floor in red states like Missouri and Arkansas as a sign that there’s widespread public support for a wage increase. 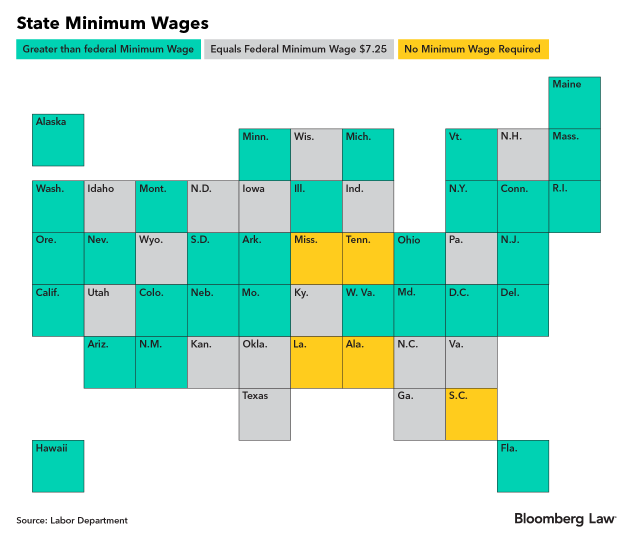 At least 29 states and Washington, D.C., have wage floors higher than the federal $7.25. Merchants such as Amazon have also increased minimum wages for their employees. The federal legislation also comes amid ongoing protests by the labor-backed “Fight for $15" movement. Democratic control of the House means the legislation will likely be teed up for a vote. The Democratic party calls raising the wage floor a key legislative priority for the 116th Congress. That makes it likely the bill will come before the Committee on Education and Labor in coming weeks. Scott has told Bloomberg Law that pushing legislation to raise the current $7.25 minimum wage would be one of the first acts by the panel. The introduction of the Raise the Wage Act in the last Congress included an immediate $2 raise to the minimum wage and the tipped minimum wage, followed by a set of annual increases to reach the $15 hourly rate. Some Republicans have expressed concern about more than doubling the current minimum wage, citing possible job losses and business closures. Democrats, however, say the increase is needed in part to match the rate of inflation since the last minimum wage increase in July 2009. The proposed $15 wage floor could essentially pass along party lines in the House. But it would face a challenge in the GOP-controlled Senate. Moreover, President Donald Trump’s economic adviser, Larry Kudlow, opposes a federal minimum wage.